At last! Netted my first young-of-the-year blackfish last week in a shallow muskeg site north of Anchorage. This marsh is also a thriving threespine stickleback nursery--stickleback fry were everywhere. The blackfish fry are so elusive! I caught this little guy with a dip net; any tips for improving my netting skills in marshy waters? We also tried seining a nearby roadside pool but had little luck due to the dense vegetation; I did catch one juvenile blackfish with a dip net. 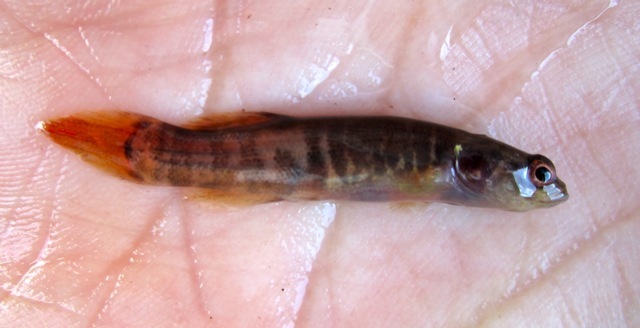 One unbaited minnow trap soaked for 48 hours yielded abundant adult blackfish at a nearby culvert. Those are interesting. I've never seen them before. What can you tell us about them? You can scroll down the Pikes and Mudminnows section to see my 2 other posts on blackfish including informative websites...they are very cool fish found only in Alaska and Siberia...enjoy! Edited by FishofSchool, 05 August 2010 - 12:40 AM. FoS, I always look forward to your posts. Very little information is readily available about Alaska Blackfish and I have always thought they a seemingly interesting fish. One day when I get up to Alaska I wouldn't find trying to find some of those fish myself. Those Muskegs don't look like they would hold much in the way of fish! More like a wet field. Thanks,Andy--you must plan on a trip to AK, and I will personally take you fish watching at my favorite sloughs and marshes--bring your chest waders . 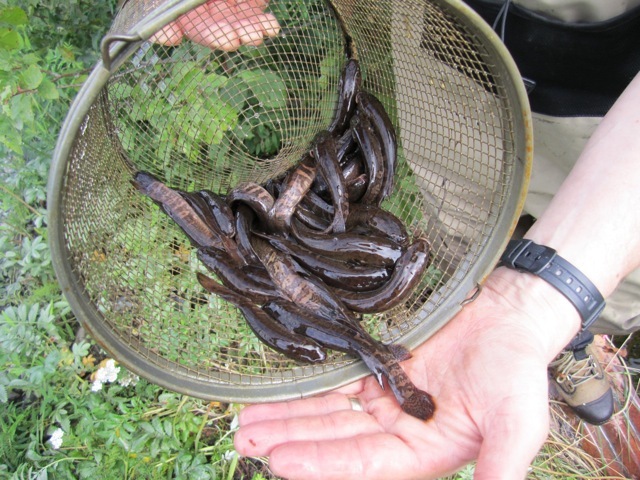 I too was really surprised to discover fry in the swampy muskegs, although this particular site is extremely rich in inverts for feeding hungry juvenile blackfish. Plus, there are pockets of open water nearby. We are noticing how much blackfish move among and between sites. They dive into loose substrate (rotting plants and peat) to escape not only predators but encroaching ice during wintertime. Fish and Game recently rotenoned a small lake in town to kill invasive pike; the treatment was applied just before freeze-up and dosage was heavy enough to kill the hardiest of fishes. Blackfish survived, we are pretty sure by diving into substrate below the 1/2 inch penetration zone of the piscicide. Their survival feats are quite amazing! Those are some slick looking fish! Thanks for posting. I would love to get my hands on a group of those. Alaska is bit of a drive from Central New York though! Keep on posting pics of those beauties. Those are great fish. After the fist time I saw our blackfish topic I did some research and they are pretty cool animals.